If you could only visit one resort in the world, this should be it. 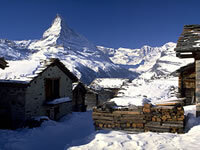 Zermatt sprawls either side of the river with mountains rising from either side. There are slopes to suit all standards except absolute beginners (for whom the resort doesn't really cater for). Few places can match this combination of excellent slopes, reliable snow, magnificent scenery, alpine charm and stunning views. Cars are banned from the centre, so if you are driving, you can leave it nearby (for a fee). Many complain that the resort centre is instead plagued by carts and taxis. The lift system dates to the construction of the Gornergrat cog railway in 1898. A combined liftpass with Cervinia is available, but it is more sensible to pay the daily supplement for the days which you do venture to the resort. For a resort with such good and extensive slopes, there is a high average age, with many visitors being over 40.
lively nightlife with a good range of cafes and bars. vast selection of fabulous restaurants. typical 3 course meal approx SFr35.